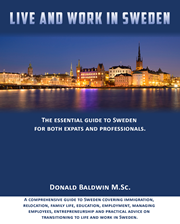 Live and Work in Sweden is a book written for the expat community from an expat perspective. Whenever there is a gathering of expats in Sweden in which business and employment related issues are discussed, a number of recurring themes come up. Among the most common topics are the Swedish meeting, understanding the different agencies and procedures for registering an individual or company in Sweden and recognizing that Sweden has different social rules and values. Sweden is a highly developed western country where most of the native population is relatively fluent in English – the problem for many expats is that while most Swedes can converse, read and write in English, they prefer to use their own language in business and work settings. Sweden is also good at adopting bits of culture from other countries, notably the United States and the United Kingdom. English is a mandatory subject for Swedish schools and combined with the considerable amount of television content in English, most Swedes tend to retain their English language skills. An important feature of Swedish business life is the meeting – anyone that has done business with Japanese organizations and who is familiar with the Japanese business concept of Nemawashi will find Swedish meetings much easier to manage. Nemawashi is a formalism in Japanese culture that involves meeting each person involved in a decision in order to get agreement prior to the meeting that works well in Sweden. Any meeting with Swedes should include an agenda and any important documents should be printed out and provided in time to be reviewed. It is also important that someone takes good notes so that the minutes of the meeting and any decisions are circulated and agreed to. When dealing with business transactions – both commercial and consumer – it is important to investigate up front how long a transaction normally takes to get completed. Simple tasks such as getting a telephone line or internet connection can often take more than a month and sometimes several months. Business contracts for services can be annual or multiannual and often cannot easily be cancelled without paying the entire amount remaining on the contract – it is important to look into early termination clauses. Debt collection in Sweden is very streamlined and is handled by a government agency – having negative credit marks in Sweden is seen as a stigma and will cause a lot of problems. Managers and human resource staff working for foreign companies – especially those from the United Kingdom, United States and Asia – are commonly caught off guard by Swedish labor laws. Ask open ended and follow-up questions: Make sure that when you ask a question - especially when dealing with government agencies, accountants, lawyers and other service providers - that you ask open ended questions. When dealing with Swedes, always follow-up with additional questions to ensure that you get the whole picture. It is often beneficial to have the person you are dealing with explain the entire process from start to finish. Swedes have a habit of only answering the question that you asked and not providing additional, often important, details. For instance, it is common for someone that wants to start a company to hire a law firm and then find out that the company was registered as a legal entity with the companies authority but not registered with the tax authority - companies need an organization number to officially exist, be registered as an employer to hire people, have a VAT number to process value added taxes and be F-Skatt registered to avoid having their customers withhold 30% of their accounts receivable (all of which Is handled by the tax authority).